Things are never easy when you're making a Duke Nukem game. The developers of Duke Nukem: Critical Mass are now dealing with the fallout of the bomb dropped by Gearbox earlier this year, finding themselves without their main character. 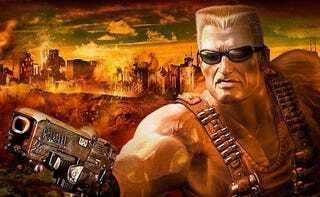 Frontline Studios were going to make a pair of Duke games for the PSP and Nintendo DS as part of the Duke Nukem Trilogy. Plans have changed. Duke Nukem has been yanked out of those games and replaced by "Cam Nash." What was once known as Duke Nukem: Critical Mass is now Extraction Point: Alien Shootout. "Duke Nukem Critial [sic] Mass on DS and PSP consoles are not going to happen after all (feel free to ask why! )," the developer explains in its newsletter, spotted by Polygamia. "But fear not - we're still releasing the games. It's just now called 'EXTRACTION POINT: Alien Shootout'." Looks like the former Duke game is also switching platforms. Extraction Point: Alien Shootout will be available for the PSP as a digital download on PlayStation Network later this year and on Nintendo's 3DSiWare store in 2011, according to Frontline. At least we have Duke Nukem Forever to look forward to, which we expect to be loaded with Duke.